If you hold federal student loans, you borrowed money from the U.S. Department of Education (ED) via their Federal Student Aid program. To handle the repayment of those loans, ED uses student loan servicers. Currently, there are 9 federal servicers under contract with ED. 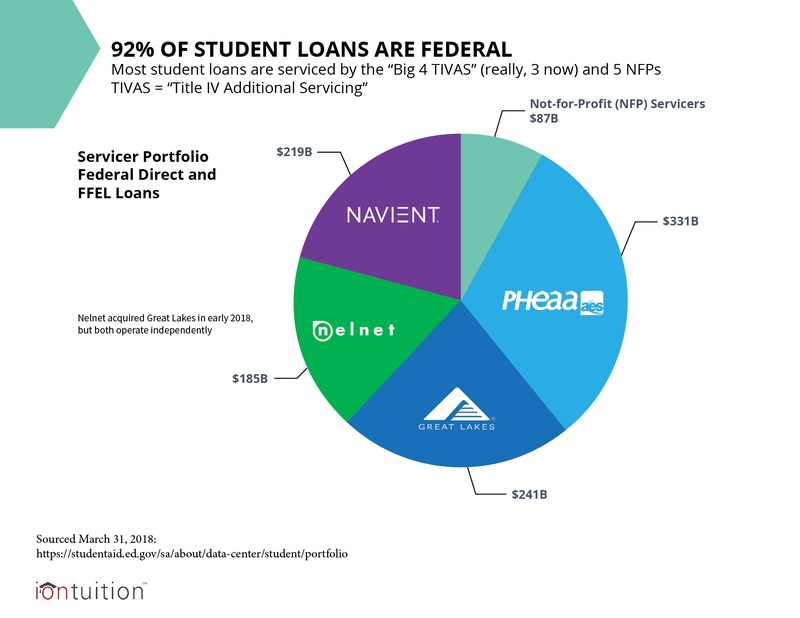 Chances are that employees with student loans have a federal servicer. How are student loan servicers assigned? Borrowers choose ED as their lender when they complete the FAFSA, but they don’t get to choose their servicer. ED assigns student loan servicers. In some cases, ED may transfer federal student loans to a different servicer. This is supposed to occur to ensure that borrowers are provided with a reasonable level of customer service and repayment support. Unfortunately, this doesn’t happen often and most borrowers are stuck with their original servicer. Employees that report feeling stress over their repayment are often frustrated with their student loan servicer. The Consumer Financial Protection Bureau began accepting complaints against federal student loan servicers in 2016. Since then, they’ve received over 50,000 complaints. The most common issues involved mishandling payments, such as this borrower, who wasted nearly $1,000 on mishandled overpayments. These issues are concerning because student debt is already an overwhelming burden. If borrowers don’t have confidence in their servicers, they’re more likely to feel stressed at work or even stop making payments altogether. Companies that offer student loan benefits are providing advocates that can help employees work with their student loan servicers. Can employees change student loan servicers? If employees don’t like their student loan servicer and would like to switch, they have limited options. There is no “Student Loan Servicer Change” request form to file. The easiest way to change student loan servicers is to refinance loans through a private borrower. Employees that have IonTuition can use IonRefinance, to compare offers from multiple lenders. We offer advice to help borrowers decided if refinancing is the right decision, so employees don’t miss out on better repayment options such as income-driven plans. If refinancing is right, we encourage borrowers to check for unbiased reviews of student loan refinancers from reputable sources such as NerdWallet before committing. Will student loan servicers ever improve? There is always hope that student loan servicers will improve their performance. Many lawsuits have been filed in response to the complaints and it’s likely that changes will be made to improve the customer experience. ED also released an app as a part of its NextGen program and have many other improvements planned for 2019. In the meantime, student loan benefits such as IonTuition is here with concierge counseling services to help you work with your servicer. Interested in learning more about student loan benefits? Attend our free webinar this Wednesday!